ProFishNC Charters Fishing Report: Black Seabass Fishing at its BEST! 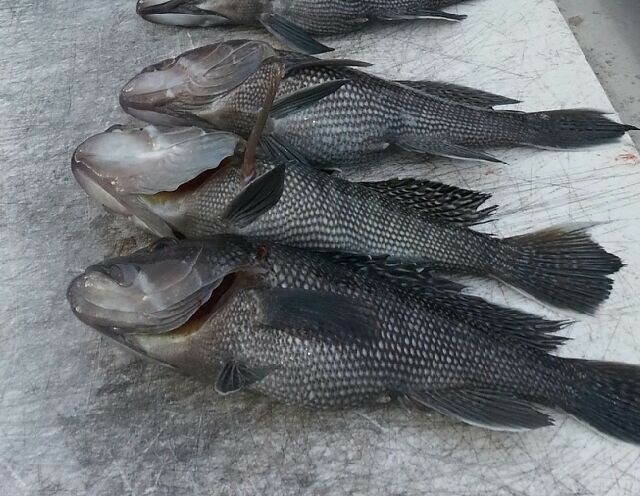 ProFishNC Charters March Fishing Report: Black Seabass Fishing continues to be the HOT TICKET! As we get closer to Spring and the waters warm the baitfish will show in greater numbers along with the Gamefish! Currently, our Water Temps at Topsail Beach, Wrightsville Beach, Carolina Beach, Wilmington & Figure Eight Island NC are between 48 & 52 degrees. This winter has been unseasonably cold and is having and influence on the water temps; however, on those consecutive warmer days the water temps do rise a few degrees! Inshore Fishing this time of year can be a little tricky with some days being more productive than others. We can chase Red Drum this time of year in the shallow waters where we will find them warming up and “sunning”, the Black Drum are in the creeks and deeper water spots, there are smaller sheepshead and tautog around rock-piles and pilings. It will be only a matter of days – a few weeks when we will see some of the Larger Speckled Trout showing up for some fun catch and release action. 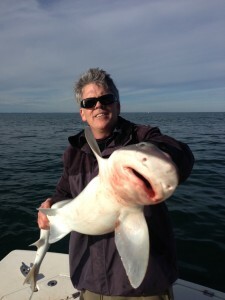 Nearshore Fishing continues to be productive as I LOVE bottom fishing this time of year due to the action it provides! The HOT BITE right now is none only than the delicious Black Seabass. We are catching limits in the 2 – 10 mile range right now fishing with both mullet on bottom rigs, vertical jigs & finesse baits on jig-heads. We are also catching TONS of Smooth and Spiny Dogfish a/k/a “Green-Eyes”… These guys are a blast to catch on light tackle! *Remember: Black Seabass are currently OPEN TO KEEP (in recent years past they have been catch and release only this time of year) & Speckled Trout are catch and release until June 15th! The most important report to date… ProFishNC Charters welcomed baby Hadley Maria Smith into our family a few weeks ago! I couldn’t be a prouder daddy!!!! I know she will be the best Fisherman the East Coast has ever seen! Give me a call or e-mail anytime and LETS GO Fishin’! This entry was posted in Fishing Reports, ProFishNC News, Uncategorized on March 5, 2014 by admin.